How will blockchain change the world in 2019? The largest universities-led blockchain conference in Europe will take place at Imperial College London on March 23rd, 2019. Blockchain In the Digital Economy (BIDE) 2019 will unite up to 500 leading academics, students and professionals in a value-driven push for boosting sustainable blockchain adoption. The 2018 crypto-market crash has helped to dispel some of the hype surrounding the blockchain space, clear the field from non-value-adding projects and warn off casual investors. The focus has returned to research, development and launching solutions able to improve business models and deliver clear economic and social benefit. 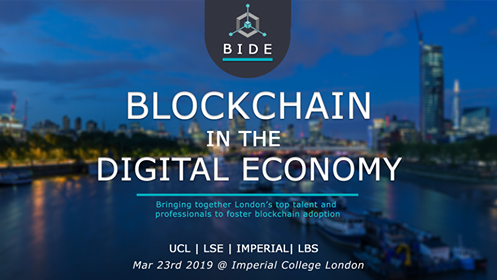 BIDE 2019 leverages the scientific power and the student talent of the UK’s leading universities to empower individuals and corporations to maximise the potential of blockchain in 2019. The key tool to powering the world-changing impact of blockchain remains education. With the goal of educating and connecting students, academics, professionals and policy-makers, London Blockchain Labs (LBL) has grown to be the UK’s biggest university-based blockchain community, with 3000+ members across UCL, LSE, Imperial College London and London Business School. Blockchain adoption is being held back by a huge talent gap. For each available blockchain developer there are ~14 job openings, and there are countless more gaps for decision-makers, able to identify blockchain-driven value and execute long-term digital strategies. LBL’s mission is to fill the global blockchain talent gap, by educating the next generation of blockchain developers, managers and researchers. 14+ Directors, CxOs and Chairpeople from UCL, Cambridge University, Barclays, HSBC, Bank of England, ConsenSys and others will share their experiences and insights across academia, industry and government. Hyperledger and its associates Omnitude and Jitsuin will run a hands-on workshop, coaching on how to execute successful enterprise-grade blockchain projects. 3 VIP roundtables will allow decision-makers to debate the next steps in financial sector implementation of blockchain solutions, omnichannel international regulation and the sustainable adoption of cryptocurrencies. Organised SMART Networking and Speed Interviews will allow leading firms to connect with the most talented blockchain students from across UCL, LSE, Imperial, Cambridge, Oxford, LBS and other leading universities. Non-profit — our partners are driving education too!